There's nothing I dislike more, in context of food shopping like buying something, only to realize X amount of time later it's not been used and is beyond repair, on its way to the compost bin. I try recipe planning and sometimes it works, but other times, especially when working with a new ingredient it does not. Some time ago, I bought white miso. It was a relatively large container from a Korean supermarket. I had no idea how much miso is actually used in the recipes I wanted to try, nor did I really have much choice in quantity. Long story short, I tried one, ONE! recipe, and a month later waved goodbye to the rest of the miso as it tumbled into the trash. Last week I had a craving a healthy dinner and thought of miso cod. 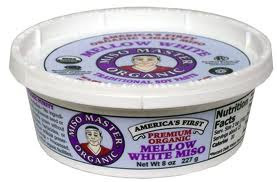 Whole Foods is usually good with keeping up on foodie trends, and had a decent selection of miso types, ranging from red (saltier/stronger) to white (milder) to sweet. And to my excitement, ranging in container sizes! I decided then and there, I am going to use it to the last drop (chunk?) even if we grow sick of it (spoiler: we didn't). I started with the cod, accompanied by garlic & ginger bok choy. For the cod, I followed the Nobu recipe loosely. Wash the cod and pat dry. Mix the glaze until smooth and uniform. Spread about 1/2 of glaze on the cod and let stand for about 20 minutes as you prep your side (see the bok choy below). Preheat oven, broiler on high. Place the cod in the oven for about 3-4 minutes. Check on it to make sure the top is starting to caramelize into a nice deep brown color. When the char level is to your liking, take out of the oven. Change oven from broil to bake at 375 F. While your oven is cooling, spread the rest of the glaze on the cod. Return to oven for another 6-7 minutes. Serve immediately. Separate and wash the bok choy leaves. Dry them and trim off a bit of the white base. I prefer them in long, but that's because I have a giant roasting pan, if you do not, you may want to cut them in half so they fit. Watch the quantity as well, as your pan has to be closed (e.g. fit just the right amount of stalks) . Heat ginger and oil in a pan, add minced garlic. Cook on medium heat until the garlic is just starting to turn color. Add in the bok choy, mix to coat the leaves / stalks evenly. Cook for about a minute. Add in the stock, and immediately close the pan with a lid. Cook for about 2 minutes. Season with salt and serve. Later in the week, I decided to try a similar recipe with salmon. There are very few differences, but I felt this was a more involved, longer process then the cod. I think, generally, the oilier the fish, the longer it needs to sit in the marinade. Thus, salmon was marinated overnight as opposed to the cod. Because it was naturally heavier, I served it with Lemon Pepper Pappardelle. Mix sake, mirin and OJ with sugar, until the sugar is fully dissolved. Add the miso paste and ponzu sauce. Place the marinade and salmon in a zip lock for about 24 hours and store in the fridge. When ready to cook, pat dry the salmon. Place the remaining sauce into a small sauce pan, and reduce sauce until thickened. Cool the sauce. Brush the sauce atop the salmon, place into the preheated oven on broil at high. Cook for 3 minutes. Change to bake at 350, and cook for another 6 minutes (this depends on the thickness of your salmon and your preferred level of cooking; I prefer my salmon medium-rare). As my final attack of the miso, I made a breakfast dish today. Preheat oven to 400F. Cut tops off the tomatoes, and scoop out the flesh and seeds. Mix olive oil, miso and a bit of salt into a paste. Scoop about half a teaspoonful into each tomato "shell". Spread the miso mixture on the inside of the tomato. Break eggs, one at a time into a ramekin or a silicone cup. Pour off egg white into a tomato "shell" to fill it, pour off the rest of the white and yolk into another tomato "shell". I found that it took about 1 large egg, per 2 campari tomatoes, however if your tomatoes are different, you'll have to adjust accordingly with eggs. Repeat the process until all your tomato "shells" are filled. Oil a small metal baking pan, place tomatoes carefully in. Place into the oven for about 15-17 minutes. At that point, the yolks will be coddled. Serve with your favorite herb minced on top. My parents have jointly been perfecting the old favorite, lekach cake. The funny part about it, that even though everyone and their neighbor referred to this cake as lekach (and some as yellow bread, you know who you are) it's everything but! In fact, this is a recipe for a close cousin on the angel cake, but a richer, yellower, prettier cousin. My mom refers to it as biskvit. It's a base for a lot of cakes, but the best method of consumption is naked; in its original form. It's light and fragrant, and low on gluten. She volunteered this recipe, so I caution that technique and order are as important as the ingredients. One omission, temp difference, jog across the kitchen while the cake is in the oven, and you will not reach the perfection she has many times over. Proceed with caution, you'll thank me her later. In a small dish whip yolks with a hand mixer with 3 tbsp of sugar, until they triple in volume. Set aside. In a separate dish, whip the egg whites with a clean hand mixer until soft peaks are starting to form. Slowly start adding the remaining sugar & vanilla sugar as you whip into stiff peaks. Combine in the yolk mixture, into the egg white mixture slowly folding in with a silicone spatula. Do not over mix! This does NOT have to be a uniform color. Sift the flour, slowly, over the bowl in small amounts as you SLOWLY incorporate by folding with your spatula. Again, do not over mix! Transfer the mix into a buttered and floured aluminum bundt pan. Place into the preheated oven and bake for 45 minutes. Do not open the oven during this time or the cake will settle. At that point, an inserted toothpick should come out clean. Cool, upside down on a board. Remove from the pan only when the cake has fully cooled. Don't forget a glass of ice cold milk! (c) 2012 YM farejudgement.com. Simple theme. Powered by Blogger.